Politics Media and Democracy in India: Providential Escape or a Miracle!!! "Phanoos banke jiski hifazat hawa kareWoh shama kya bujhe jise roshan khuda kare..."
this blog is about the dirty politics that media &mediapersons play in India. attempt is to expose the corruption in media.attempt is to bring in public glare unethical, unprofessional conduct of media & its corrupt persons. Providential Escape or a Miracle!!! "Phanoos banke jiski hifazat hawa kareWoh shama kya bujhe jise roshan khuda kare..."
Indians have been clamouring for resolute leadership now for over 4years. Congress bubble burst a long time back with predictable results. 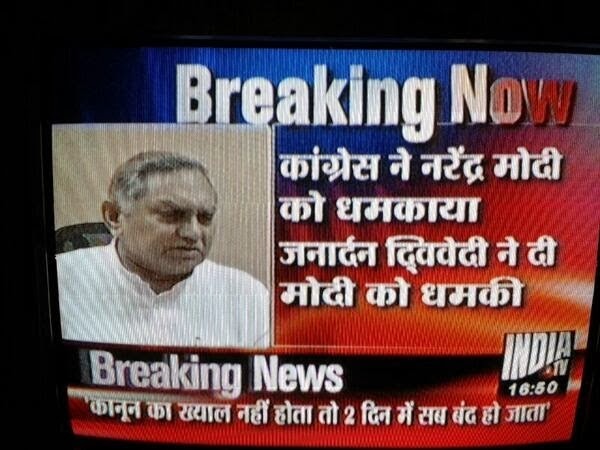 There were many including me who had been maintaining Congress was incapable of taking India forward. The chaos that is prevailing currently does not need any explanation. The man that Indians wanted got his orders in bits and pieces but he did get them starting with, BJP National Executive meet in Goa. Panaji time is 2.04 09th June : Rajnath Singh 2014 elections are a challenge for the BJP. "We have decided Narendra Modi as chairman central campaign committee. This is an unanimous decision. We have full confidence that BJP will come to power in 2014,"
Followed by open revolt by the senior most member of BJP, this was quelled after some real hard work. However the wheels had been set in motion, Indians wanted this and they were granted their wish by the party. Greed is unlimited, we were not going to be satisfied with just this announcement, we wanted our man to be unambiguously made as the party candidate for Prime Minister’s post. 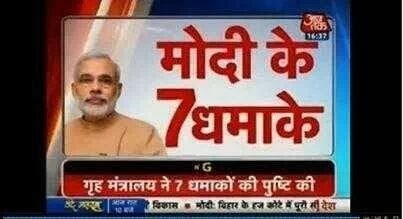 Much speculation regular TV debates, heartburns and finally that day also dawned. BJP president Rajnath Singh says the party has projected Narendra Modi as the PM candidate. Rajnath also said that Modi ji is going to meet Advani ji soon to seek his blessings. Now that we had our major demand acceded, there was much reason for all to rejoice. Euphoric and filled with anticipation of very positive outcome in near future public started to come out to listen to their favorite candidate for Prime Minister's post. 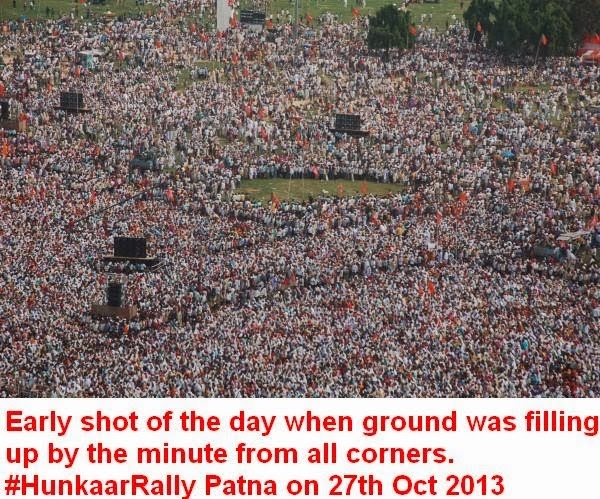 Record turnouts in rally after rally gave the masses further hope and vindication of their choice. In all this while the public wholeheartedly endorsed Mr. Narendra Modi, his political opponent did not lose any opportunity of attacking him with the same old rhetoric which we have been hearing for past 11 years. 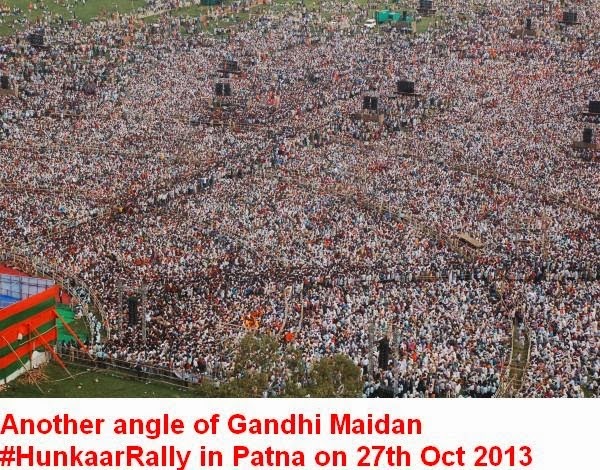 27th Oct 2013 Patna Bihar. This is one day that no Indian should ever forget or be disdainful about. It was pure providence that today on 29th Oct we are not in the midst of national mourning for a heavy loss of human life at Gandhi Maidan Patna. 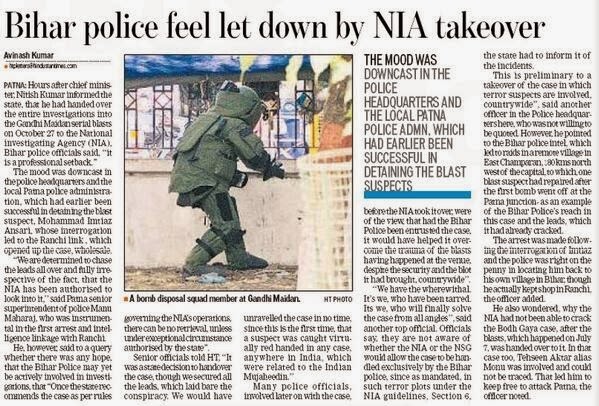 Many have expressed apprehensions about safety and security of Mr. Modi. 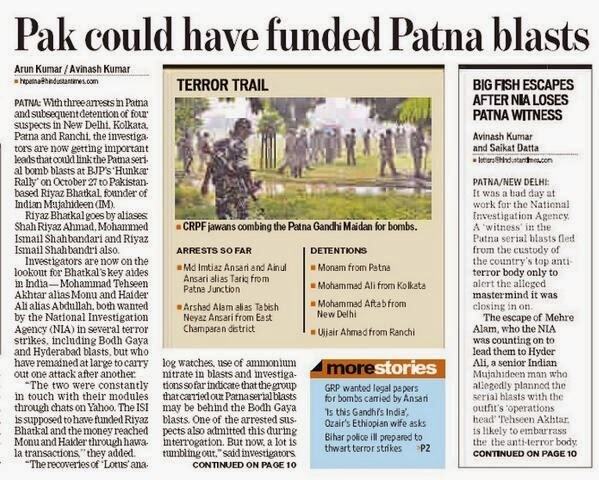 The unthinkable did happen in Patna on 27th Oct, which witnessed as many as 6 blasts, under normal circumstances this should have been enough to cause a stampede, among the people assembled at the ground to hear Mr. Modi deliver his maiden speech in Bihar. The day was saved by some quick thinking and resolute action by the leaders present at the venue who made light of the incident of the blasts, had even a slight hint of nervousness or anxiety been displayed by anyone of them it would have lead to disastrous consequences. People of Bihar who had congregated at the maidan deserve a lot of praise for the discipline and calmness displayed in the face of imminent danger of blast and/or stampede that was targeted by setting off so many blasts. The appeal and charisma of Mr. Modi kept the people rooted to their spots not that people in the vicinity of blast sites, would not have seen the dead and the injured yet it did not trigger any panic reaction or the desired stampede. 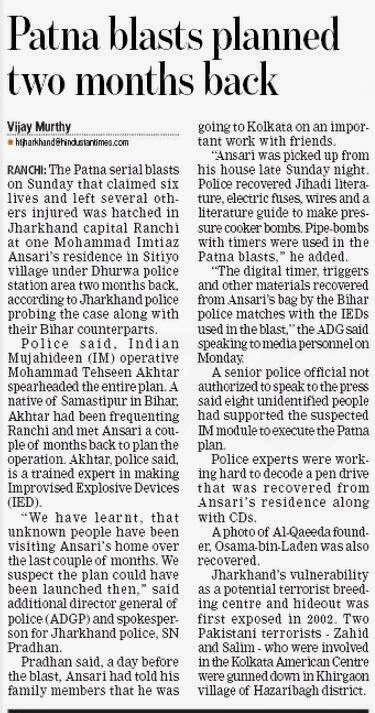 Post the rally more Improvised Explosive Devices were recovered, some as close as 80feet from the stage from which Mr. Modi had addressed the gathering. 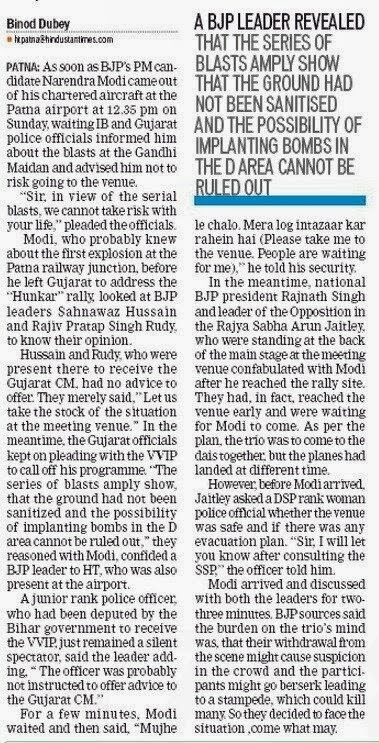 It’s not that BJP leaders at the venue were unaware of what was transpiring, it took exceptional courage in face of imminent personal danger to carry on with the rally and also ensure the mammoth crowd which was in attendance was kept calm thru their reassuring words and normal behaviour. Media has left us disgusted with its conduct and coverage of the horrendous event. Instead of focusing on the attempted assassination bid on Mr. Narendra Modi, the presentation of news was as if Modi was not at all going to be affected by it. Political opponents reacted along expected lines; which leaves much to be desired. The callousness of Congress is contemptible. To suggest that blasts were orchestrated by BJP to evoke sympathy for self is something that no sane person would state. 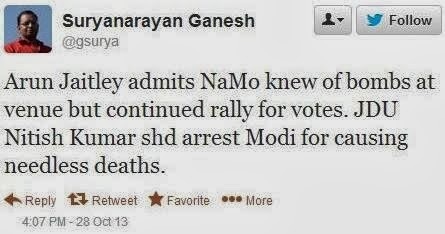 Insanity can only be the reason for such a statement. Politics of hate! is not what this country needs. Political opponents deserve the respect and empathy when faced with such a grave situation. But then Congress is Congress, it thrives on callousness, otherwise would the lot off Indians not be better today. 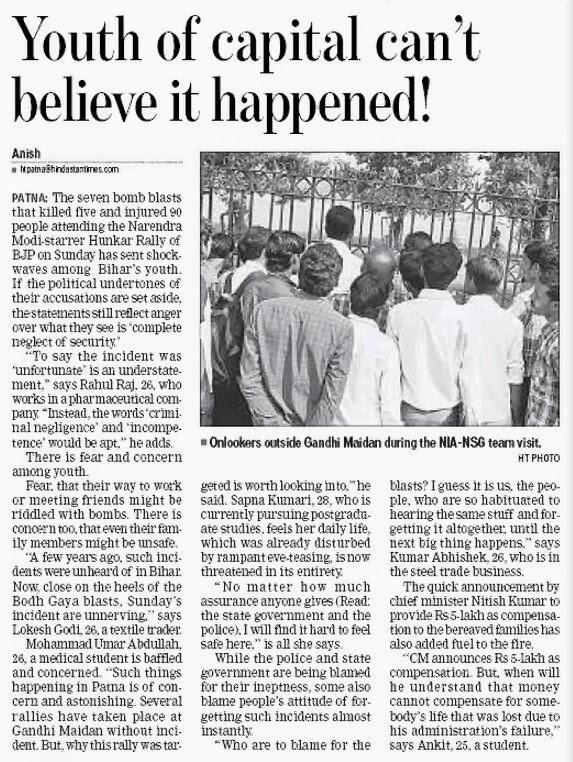 Government of Bihar needs to explain why the standard procedures for securing the venue, and safety of not just BJP leaders, but the people of Bihar was not taken seriously? 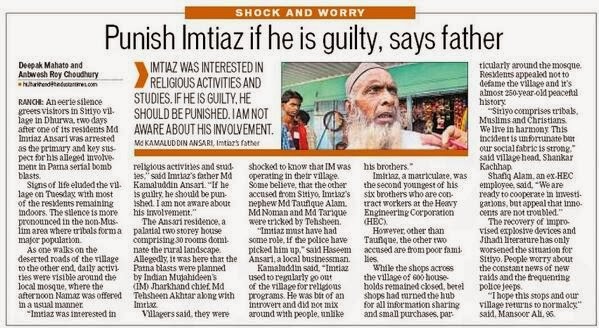 Innuendoes and improper remarks will not suffice, public is angry for this serious lapse. 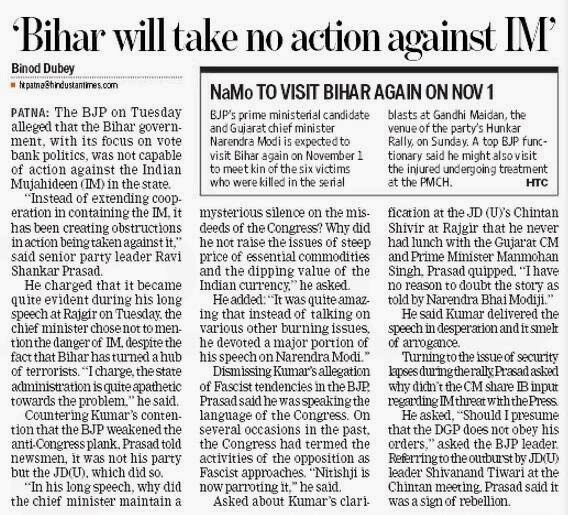 Negative impact is not limited to Government of Bihar, it has also implication for the Union Government of Congress. Democracy will be best served by eschewing hatred and vindictiveness. Mr. Narendra Modi is a declared candidate for the post of Prime Minister, win or lose is not the issue his security is definitely an issue which should not be glossed over or denied for partisan reasons. Public is alert and is watching, they are demanding highest possible level of security for their candidate. Nothing but the best for our leader will we accepted. To conclude this post placing links to various articles most of which are courtesy Mr. A.S Raghunath. 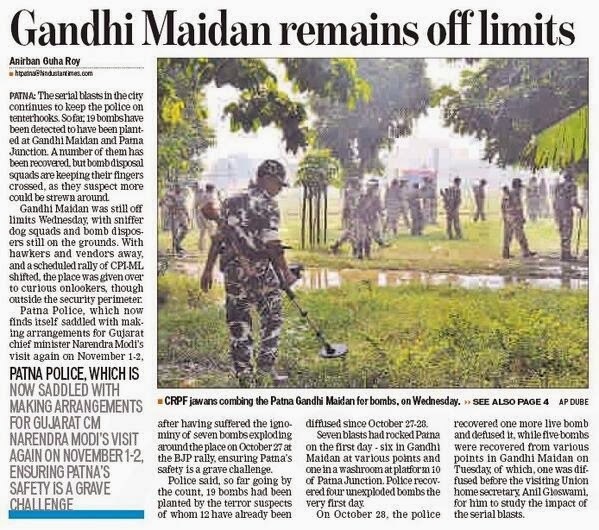 which the readers may peruse to get a clearer perspective of the situation and the challenge that was faced bravely by all concerned at Gandhi Maidan Patna on 27th October 2013. The magnitude of the averted disaster should have sent shock waves in the administration, engendered hard introspection, imbued a sense divine relief and stirred modicum of sympathy for main target. But the very next day hostile acerbic political comments were being made by the person who should have been most apologetic. Those comments and lessons in history could have been reserved for some other day. 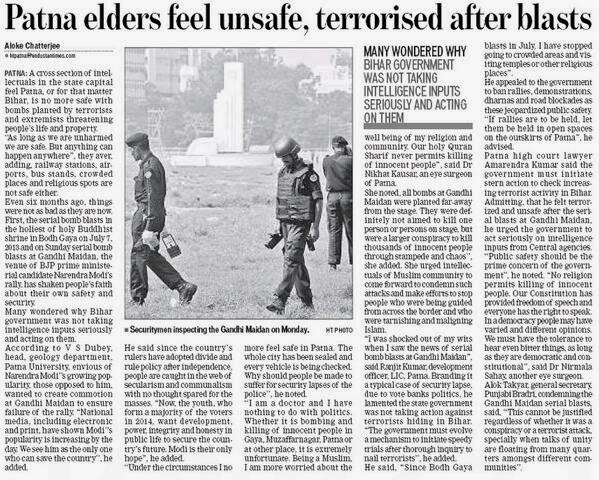 The blasts at Gandhi Maidan pose the most alarming question, i.e. is Pakistan going to determine who will be the next prime minister of India? https://pbs.twimg.com/media/CMa4FUvUAAA0pGA.jpg. Simple theme. Theme images by luoman. Powered by Blogger.